HEALTH SERVICES AND MENTAL HEALTH ADMINI! agent of canine abortion while pipetting these organisms. 4 months before; it subsequently rose to 1:250 on April 10.
disappeared after appro\ximatel\ I month of treatment. the agent rose to 1:500 later in June. and testicular atrophy. Cases have been recognized *hr.,imh. outbreaks have occurred in large commercial kennels. has been proposed and is now under consideration. I('armic hal, L. E., and Bruner, D. \\. : Cornell Vet, in press. nnegative bacterium. Vet Med 62:543-.1 1967.
organism causing canine abortion to smooth and rough brucellae. of the ca usative agent of canine abortion. J Bact 625-30, 1968.
although pain persisted in the calves of her legs. anim al contact or tick bites. plaining of ixtremre miyalgia. His temperature \ as 1041F. bacterial and I eptospira cultures. he was discharged from the hospital. and a 3+ reaction at 15 days. period in 1967 (Figure 2). over the corresponding 4-week period in 1967.
during the summer of 1966 (\MMVR, Vol. 15, No. 29). division has had excess pneumonia-influenza mortality. from all causes only in the 28th week. and influenza.Mortality in children under 1 was unaffected. Crop Bulletin. 55(24-31), 1968. Edited by J. L. Baldwin. two families, each with three cases. recognition and reporting is unknown. 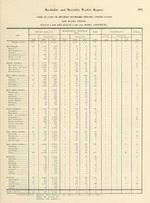 were 33 cases in males and 34 cases in females (Table2). and the preparation of meat was unknown in 17 cases. tion of historical information, clinical manifestations. for Prerention of Viral Hepatitis. has not yet been identified hut is presumed to be a virus. high degree of protection against infectious hepatitis. tween 15 and 50 days (average 25 to 30 days). mitted by ISG of this type. anticipated continuous or intermittent exposure. 5-6 weeks after exposure is not indicated. derived primarily from field and clinical observations. produce t- aret not t suitable. lines on which to base recommendations. tacts" and "Travelers to Foreign Countries"). lower for adults, their illnesses tend to be more severe. contacts who have not already had infectious hepatitis. protection when administered in doses of 0.02 to 0.05 ml./lb. if the risk is felt to persist. have close contact with patients or infectious materials. factory situation exposed to a fellow worker with hepatitis. should be considered for all those exposed to the source. rather than the 5 ml. for adults recommended here. foods and water of uncertain quality. **Repeat every 6 months of travel or residence. ceived ISG, the risk is exceedingly small. of the danger of severe reactions. equally careful studies have not substantiated this claim. genic blood products only when necessary. both a positive serologic test and a positive muscle biopsy. CHIEF, EPIDEMIOLOGY PROGRAM u IA'':M.I.I M.D. ACTING CHIEF, STATISTICS SECTION IDA L. SHERMAN. M.S.